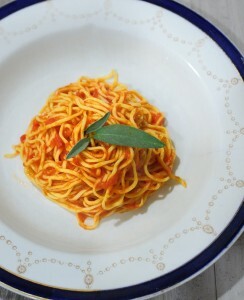 Tomato Sage Pasta Sauce :: Oracibo.com - Food, Travel, Design and Cooking! I make this lovely, light, late summer, early fall sauce every year with my own sage & plum tomatoes. The sage really works with the sweetness of the tomatoes. I really like to make homemade spaghetti or tagliatelle for this yearly treat, but when there is a time crunch, I use really good dried long pasta. ** One of our favourite shapes is chitarra, a square shaped spaghetti. Some brands are made with eggs & some are made using only water & flour, either would work well. It’s vegetarian too, a really good thing! The sauce can be made a day or so ahead. Heat EVO in a heavy large saucepan over medium heat; add carrot, garlic & onion & sauté until soft, 5 – 10 minutes. Add seeded tomatoes, sage & salt; cover & simmer 20 minutes. Remove sage & reserve. Cool the sauce for 20 minutes then, puree in a processor or blender, in batches. Return the puree & sage to the saucepan and simmer over low heat until slightly thickened, approximately 10 minutes. Remove from the heat. Remove the sage to a bowl. Press out any juices from the sage & add the juices to the simmering sauce (The sauce can be prepared 1 hour ahead & reheated when required. Bring a large pot of water to a boil. Add 1 Tbsp. salt; add the pasta; cook until al dente. For fresh pasta, test after 1 minute, continue cooking as necessary. For dried pasta follow cooking times on the package, testing pasta 2 minutes before stated time. Meanwhile, return the sauce to a simmer, add the butter & pepper. Drain pasta thoroughly, add to sauce & toss over low heat until well coated. Place in a heated serving bowl and serve immediately. To seed the tomatoes, cut each in half, then squeeze out the seeds or remove with a small spoon. If you would like to see recommendations for pasta brands I like, please see my Kitchen Tips. If you would like to make your own pasta, please go to Food Processor Or Stand Mixer Pasta Dough. Thought I would share here because I don’t have your email address. My husband Bob Toth has Amyloidosis which was diagnosed in July. We began treatment here at the Mayo Clinic Rochester. This treatment process is very necessary and life threatening, thus resulting in cancellation of our trip to Italy. We are praying Bob’s results will prove effective for continued good health. Doctors here say a patient can live 15-20 years after this treatment. So, we decided to put together our ‘Bucket List’….top of the list of course is Italy…we are hoping to make it next year at this time or perhaps a little earlier. My love of cooking is not nearly to your standards, but I do love to be busy in the kitchen…I don’t try every recipe but my mouth is always watering after reading them. I just want to thank you for your kind words and your beautiful recipes…most grateful as they definitely take my mind off of the sadness at hand. We hope to be out of here at the end of the month, should all go well, otherwise not sure what’s in store for us. We continue to pray for blessings of good health for Bob so we can get on with the task at hand, living life!!! Thanks again Phyllis…we are so looking forward to meeting Ray!!! Hi Sharon…how nice to hear from you and to receiving an update about Bob…I’ll be keeping you both in my prayers and a return to good health for him! Thanks so much for all your comments…I am so pleased that you enjoy reading the recipes and trying the ones you can. I agree, as you can tell, I am in the kitchen a lot and that’s my comfort zone and at times my retreat when life gets challenging as it help me take my mind off things for a while. Please accept my warmest thoughts and blessings to that you can both, together, start dipping into your “bucket list”…Italy awaits you and you both deserve an amazing trip and to meet Ray! I know you will enjoy spending time there because both Ray and Anna Rita are such warm hosts, the food is good and so is the wine they make! Anytime you wish to contact me, I would very much like to hear how you are doing.